Two phases. Size of Buzzard, but outline and wing-position close to Black Kite; tail square-cut. More ample deep-fingered wings than Buzzard. Pale phase identified by creamy white underparts with contrasting blackish flight-feathers, kite-like band on innerwing above, pale scapulars and upper-tail-coverts and diagnostic small white spot at base of neck, seen on front-view. Dark phase similar above but under surface dark brown, or rufous with black band through centre of underwing. 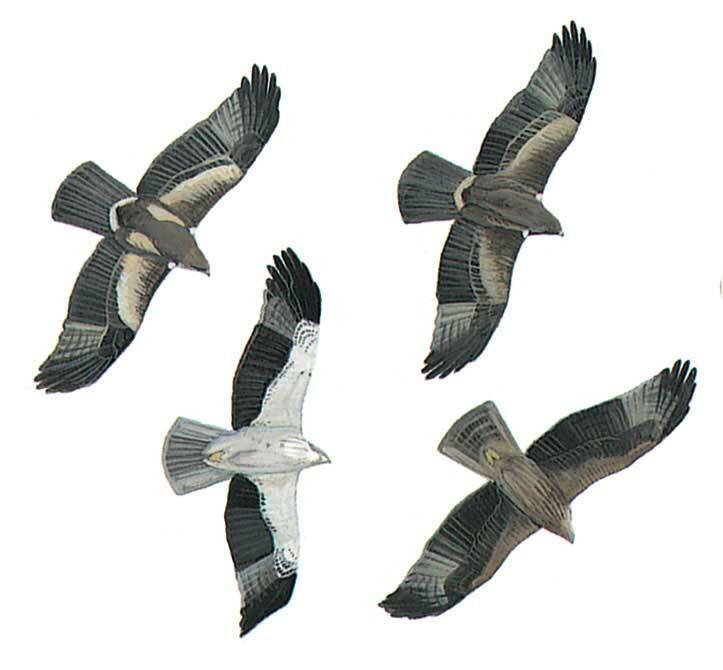 Lacks dark carpal-patch of most Buzzards; also has darker flight-feather bases, paler inner primaries, different upperpart pattern and tail shape. When perched, feathered tarsus also separates from a Buzzard. Has deeper, more powerful wing-beats and steadier glides than a Buzzard. Soars on flat wings and does not hover.